Now I know this is probably an unpopular opinion - but I bloody love Mama. From its slow build-up to its sense of menace and foreboding, it delivers on just about every level. Nothing to do with Genesis after all. Mama is, in fact, a 'presented by Guillermo del Toro' feature based on a 2008 short film of the same name and by the same people. Now, as all film buffs know, 'presented by GdT' (as he likes to be known) means many things. For a start, it means he likes it - and he knows what makes a good film, does the creator of Pan's Labyrinth. It also means it should be creepy and scary. It also means it's no guarantee it will be. In this case, however, it is. In places. In others, you'll find yourself screaming at the screen in incredulity. The story starts off well enough - father kills mother following some dodgy financial goings on, goes on run with their daughters, drives over cliff, finds house, gets whisked away by the ghostly Mama leaving young Victoria and Lilly to fend for themselves. With Mama's help. But it's OK, fear not, their beloved uncle is on the case and he will stop at nothing - including financial ruin - to track down his brother's children. And just as the money runs out, they are found. All is well. From here on in, all the fine modern horror conventions are observed as Victoria and Lilly are integrated back into their new family home. Along with Mama. And while there are scares and suspense aplenty, it's here that issues with the film start to emerge. Let's start with the positives, though. Megan Charpentier (Victoria) and Isabelle Nelisse (Lilly) are creepy as all hell. Nikolaj Coster-Waldau is great as uncle Lucas trying to give his nieces a normal life. Daniel Kash, as Dr Dreyfuss, is a fine child psychologist and Jane Moffat convinces as Aunt Jean, a woman who wants the children for herself (in a non-sinister way). Amazingly, it's Jessica Chastain (fresh from finding bin Laden) who is a problem. Now, I love Chastain. Wonderful in Zero Dark Thirty, wonderful in The Help... I had high hopes. But here she fails to convince as Annabel, a goth bass player who has parenthood thrust upon her by dint of the fact she's sleeping with the girls' uncle. If she's a goth bassist, the Chuckle Brothers are qualified decorators. Part of the problem is having her as a goth bassist. It serves no purpose other than to suggest she's wild, an individual (she has tattoos you know), a girl who walks her own path. A girl who's in the least convincing band ever is what she is. Would it have been so hard for her "singer" to at least watch a few genre-specific music videos to at least get a feel for how a singer would hold themselves? And if you're a musician, why would you just leave your bass lying around within grabbing distance of young, curious fingers? I know she's not used to children - the point is well made and well laboured from the outset - but she is supposed to be used to guitars. She is supposed to earn her living this way. There isn't a hope in hell she would just leave it on the sofa for weeks on end. She'd have moved it on day two. I'm sorry, but these sorts of things bug me. Amazingly, it bugs me more than the bit when she's upstairs while eight-year-old Victoria is frying breakfast alone in the kitchen. And this isn't the only flaw in the film. The issue of dwindling finances is important enough to be brought up just as the girls are found - and yet, it never comes up again. Even though no one seems to be working. And then there's the bit when Lucas is thrown down the stairs by Mama and taken to hospital. An odd hospital, where Dr Dreyfuss (a child psychologist, lest we forget) is the man to treat broken bones and concussion. And we are now listening with her, through the headphones. We know this because the sound clearly changes when the jack is plugged in. So it's somewhat amazing to find, minutes later, that we can still hear the interview even though she's taken the headphones off. It's a little thing, I know, but it sometimes feels like people don't actually watch the films they're working on. And either the bad aunt had a key to the house (bloody unlikely in the circumstances) or she's a grade-A lock-picker. It's one or the other. And there's a bit at the end, after the solution to everyone's issues is discovered, that'll have you laughing out loud. To avoid spoiling things, lets just ask how she managed to slip it under her coat. You'll understand if and when you get that far. Oh, and the less said about The Grudge, the better. 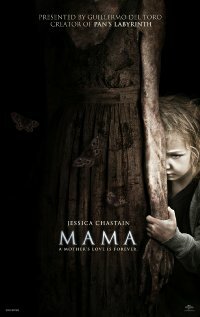 If all this gives you the impression I didn't like or enjoy Mama, you'd be wrong. Yes it's bonkers, flawed and has more plot holes than an entire Gruyere, but... it still managed to make me jump, it's filmed beautifully, I found myself holding my breath and tensing at the right moments. And the ending did not disappoint. In fact, it almost got a standing ovation (the Wittertainment Code Of Conduct prevented me, but I was cheering in spirit). Because, with all that's wrong with Mama, the fact the Muschetti's had the balls to do what they did deserves high praise indeed.